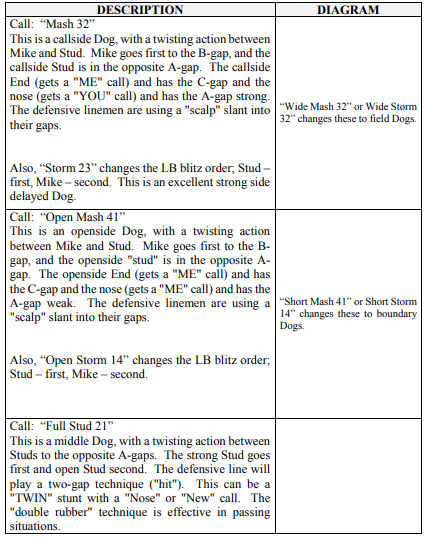 All of the Dogs, including the Two Backer Dogs use word calls that identify the defenders involved in the Dog and the blitz numbering system to identify the blitz gaps. 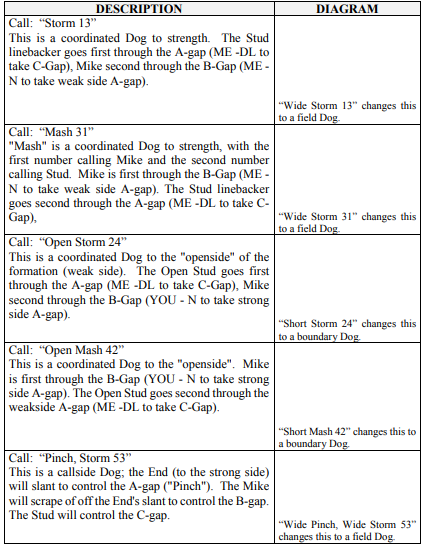 The word call puts the strong side (“callside”) defenders in the Dog. 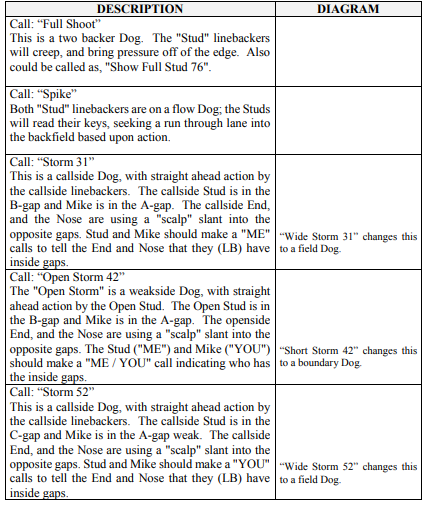 However, all of the Two Backer Dogs can be run based upon field by adding the word “WIDE” to the call. This changes the numbers with the odd numberings to the field, and even into the boundary. The two backer dogs are coordinated run through action by the linebackers. The defensive linemen may have an automatic “scalp” slant to a gap. The linebackers must know who is going first whenever there is a twisting or crossing type action. 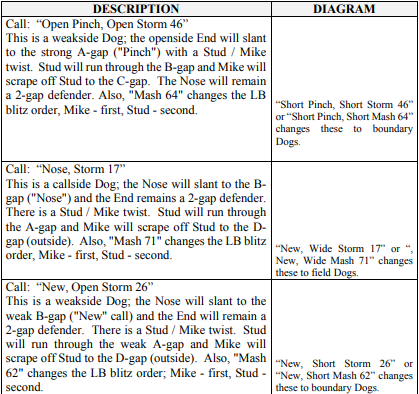 A Single Backer Dogs can add a second backer to the stunt by adding the word “FULL”; i.e., Full Stud. The first number refers to the callside Stud, and the second number to the Open Stud. 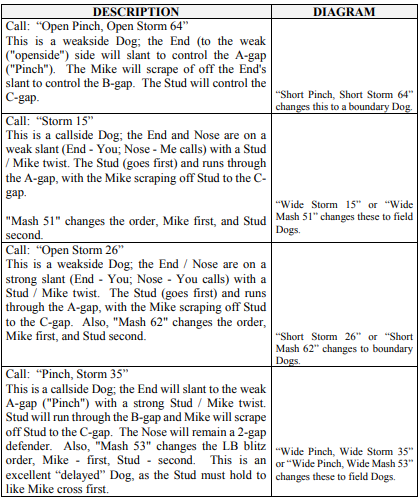 “STORM” and “MASH” are two backer dogs that involve Stud and Mike. 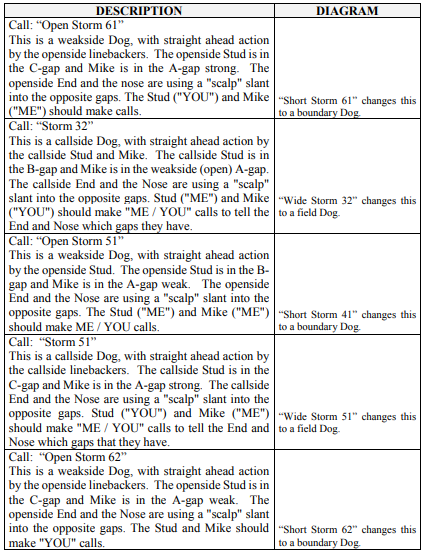 The first number on a “Storm” gives the callside Stud his gap, and the second number the Mike. This is reversed in “Mash”, with the first number identifying the Mike’s gap, and the second number the callside Stud. A “TWIN” stunt is when either two linebackers are attacking the same gap, or a defensive lineman and linebacker are attacking the same gap. These stunts require timing to allow the first defender to attack; with the second defender arriving after the offensive lineman has been engaged by the first defender.